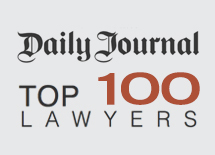 Patricia Glaser, head of Glaser Weil’s Litigation Department, has once again been named to the Daily Journal’s annual list of the “Top 100 Lawyers in California,” which recognizes the superior achievements of the state’s top attorneys. Ms. Glaser and her litigation team represent many well-known corporations of national and international prominence, as well as leading technology- and entertainment-related individuals on high-stakes and high-profile matters. Her 2018 Daily Journal profile highlights some of her current cases, including the representation of John H. Schnatter, founder of Papa John’s, in connection with allegations arising from an article published in Forbes that mischaracterized comments made by Mr. Schnatter. Ms. Glaser is also representing Former Assemblyman Matt Dababneh, who resigned last year amid allegations of sexual misconduct, in a lawsuit against the accusing lobbyist for defamation and the intentional infliction of emotional distress. Earlier this year, Ms. Glaser was retained by the Special Committee of Guess?, Inc. Board of Directors, which was formed to oversee an investigation into allegations of improper conduct by the Company's founder, Executive Chairman and Chief Creative Officer, Paul Marciano. With regard to these cases, Ms. Glaser explained that she is "dealing with matters that go to the heart of [her] clients' businesses. . . Each of these cases require multifaceted approaches involving business decisions, reputations and, sometimes, litigation. There are significant strategic questions every step of the way. It's work [she] love[s] because [Glaser Weil's litigators] bring to the table courtroom experience and experience with significant corporate disputes." Ms. Glaser tops the short list of trial attorneys in the nation sought after for high-stakes litigation and was recently named “Business Leader of the Year” in the Services category by the Los Angeles Business Journal. Her clients describe her as a "trial icon" and "one of the most prominent litigators in the country." She consistently ranks as one of California's top business trial attorneys by such prestigious legal and industry publications as Chambers & Partners, Benchmark Litigation, Variety, The Hollywood Reporter, the Daily Journal and the Los Angeles Business Journal. Daily Journal subscribers can read her full profile here.